New TC Electronic Vortex Flanger Guitar Effects Pedal! Fender Cables! And it does fantastic 'through zero' sounds too! New TC Electronic Vortex Flanger Guitar Effects Pedal. An endless list of immortal artists have used a flange effect to create magic. 2 flanger types. Room for choice - all of TC's best flanger settings available via TonePrint. We haven't seen your pedalboard or anything, but our guess is it's pretty full. We're guitarists after all and we live for gear. This pedal ranges from a brain twisting through-zero-flange tape echo over more contemporary sounds to an all-out flange-war, which ensures you will always be able to find the appropriate flange for the job at hand. TC Electronic TonePrint Vortex Flanger Guitar Effect Pedal NEW! 2-Day Delivery! TC Electronic TonePrint Vortex Flanger Pedal New! TonePrint Enabled. And it does fantastic 'through zero' sounds too! An endless list of immortal artists have used a flange effect to create magic. 2 flanger types. In addition, the Vortex Mini Flanger allows your dry, unprocessed sound to pass without converting it to digital, thus keeping the original tone pure and without any latency. Product information TC Electronic Vortex Mini Flanger Guitar Effect Pedal. TonePrint Enabled. 2 flanger types. Signal circuitry Analog dry-through. Small footprint. USB port Mini USB connector for uploading and editing custom TonePrints and for software updates. Output impedance 100 ohms. Dark Matter is a distortion pedal that can fully enjoy the real pleasure of distortion. Regardless of the part which said riff / lead, it will continue to bring inspiration to you over the years. It plays musical distortion in every range from bluesy crunch to high gain, and it is designed with guitarist in mind that can not be satisfied with too beautiful sound. TonePrint Technology Enabled. - TonePrint- instant access to custom pedal-tweaks made by your idols! Product information An endless list of immortal artists have used a flange effect to create magic. We call it TonePrint, and it will rock your world. This flanger will take you from a classic flange sound to a 747 taking off! TonePrint - instant access to custom pedal tweaks made by your idols! This pedal ranges from a brain twisting through-zero-flange tape echo over more contemporary sounds to an all-out flange-war, which ensures you will always be able to find the appropriate flange for the job at hand. TC Electronic Vortex Mini Flanger Guitar Effect Pedal NEW! FREE 2-DAY DELIVERY!! TC Electronic Vortex Mini Flanger Pedal NEW! AUTHORIZED DEALER! You can create your own signature pedal, tweaked specifically to your liking via the TonePrint app. When it is bypassed, it is really off and has zero influence on your tone, re­sulting in optimum clarity and zero loss of high-end. TC Electronic Vortex Mini Flanger Pedal - Tone Print Enabled! Small Footprint! Vortex Mini Flanger. TonePrint-enabled - load Vortex Mini Flanger with your favorite artist's tone. Beam-enabled - send TonePrints to Vortex Mini Flanger through our free TonePrint for iPhone and Android. TC Electronic Vortex Mini Flanger Pedal. We haven't seen your pedalboard or anything, but our guess is it's pretty full. We're guitarists after all and we live for gear. So, we've built all that is great about the original Vortex Flanger into a mini form factor so there's room for killer flange sounds no matter what your board looks like. Full Warranty. TC Electronics Vortex MINI Flanger. We haven't seen your pedalboard or anything, but our guess is it's pretty full. We're guitarists after all and we live for gear. So, we've built all that is great about the original Vortex Flanger into a mini form factor so there's room for killer flange sounds no matter what your board looks like. Make / Model: tc electronic / VORTEX FLANGER. Ishibashi Music Corporation. EMS is safe, fast (approx. ). And it does fantastic 'through zero' sounds too! TC Electronic Vortex Flanger. An endless list of immortal artists have used a flange effect to create magic. Vortex Flanger provides a simple, four button lay-out and smart mini toggle to get the job done. You've got a classic tape-style flanger effect on tap, and you can download custom TonePrint tone settings made by master guitarists like John Petrucci and Bumblefoot. You can even create your own unique tones with the free TonePrint editor software and beam them directly to your Vortex Mini with your smartphone. Shaker Vibrato has been the sleeper hit of the TonePrint series. Guitarists loved adding the life and vibe of both subtle and pronounced vibrato effects - and rightly so! Shaker Mini Vibrato. TonePrint-enabled - load Shaker Mini Vibrato with your favorite artist's tone. Type: Analog. Weight: 0.5kg (1.1lbs). Noise floor: -77dB. Current consumption: <15mA. Battery option: Internal 9 V battery connector. Power input: Standard 9 V DC, centre negative >100 mA. TC Electronic Vortex Mini Flanger Pedal New! TC Electronic Vortex Mini Flanger Pedal Features at a Glance Mono flanger pedal for electric guitar. Extra-small footprint saves precious pedal board space. High-quality components. TC Electronic Vortex Flanger TonePrint Guitar Stereo Electronics Effects Pedal. Product CodeVortext Flanger. It will surely be helpful to you. I connect your country and Japan. Is there any thing in which you are needed at an item of Japan?. We always make sure you will get what you want with prompt manner. At a GREAT price! 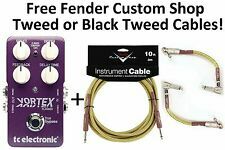 Now is your chance to get that pedal you always wanted at the price you always wanted! TonePrint Technology Enabled. TonePrint- instant access to custom pedal-tweaks made by your idols! An endless list of immortal artists have used a flange effect to create magic. 2 Flanger types - wide range of sounds from classic rock rhythm to the roar of a 747 taking of. La materia oscura è un pedale di distorsione che può godere appieno il vero piacere di distorsione. A prescindere della parte che ha detto riff / piombo, continuerà a portare ispirazione per voi nel corso degli anni. Betrieb nur mit 9V DC Netzteil möglich. - kostenloser TonePrint Editor. TC Electronic Vortex Mini Flanger. Non abbiamo visto la pedaliera o nulla, ma la nostra ipotesi è che sia abbastanza completo. Dopotutto siamo chitarristi e viviamo per gli attrezzi. Così, abbiamo costruito tutto ciò che è grande circa l'originale Vortex Flanger in un fattore di forma mini, quindi c'è spazio per i suoni di flangia killer non importa assomiglia a quello che il tuo Consiglio.